Here is a modding contest! Must be written from scratch, except for some small code part. Must be new, original and unique. Must not be a fork. Must be purposed with screenshots (if possible) and download link. Only one mod per user. Create a topic related to it. Post multiple times about it. Do mutiple versions of it. Good luck! The contest ends the 13 of May! The winner won't receive anything but glory! Your phone or window isn&apos;t wide enough to display the code box. If it&apos;s a phone, try rotating it to landscape mode. azekill_DIABLO said: Mineyoshi+ABJ+Baggins= TOPIC HIJACKED. Nice idea to change your subscription for this. You wrote, only one mod per user, but can you choose another mod after you already have chosen one to be it? Uh, why do I ask, you can edit forum posts. Do not call me -minetest. Call me DS or DS-minetest. I am German, so you don't have to pm me English if you are also German. The background is a lie. Is usage of external frameworks allowed? (like smartfs, mobs_redo, npcf)? Does the mod needs to be really really weird ? bell07 wrote: Is usage of external frameworks allowed? (like smartfs, mobs_redo, npcf)? Sires wrote: Does the mod needs to be really really weird ? no the mod just needs to be original and new! So we have to do some weird mod? What is weirdness to you? People talk about freedom of speech, so i'll say that God exists. Open your eyes!! See The big unicorn conspiracy.!! :D The government has been lying to us about unicorns!! > zm78 nice! but is it original? Is it okay to use code partially generated by Rubenwardy's NodeBox editor? I'd win that, I have already made a hacked client with fast, fly, noclip, reach, and drawing all light levels fully bright. God's not dead, He's surely alive! My Stuff | My User Page | Check out my website! <bigfoot547> I major in existing. | <RedPanda246> Not every day is good, but there is good in every day. I, bigfoot, have this special ability to destroy cameras and recording devices within a 5 mile radius of myself. Mystery solved. so for the moment we have only one man with a mod in the race. WHO WILL WIN? azekill_DIABLO wrote: so for the moment we have only one man with a mod in the race. WHO WILL WIN? You should get Chewy to submit his asteroid crystals. It's pretty wierd. sure it would be a great submission! and you duane? your mods are great please submit something! and it's from Wed, 08.03.2017, so 5 days before the contest started. @azekill_DIABLO: How new has the mod to be? This mods adds a Mheser. I'm told my sounding line mod is "weird". :) It's a block you can place that, when clicked on, will tell you how far down the next solid and liquid surfaces are (or in the case of lava, just the liquid surface - the sounding line isn't magma-safe). New! The fancy cobble house for your needs! @FaceDeer: your mod is not weird, but it's original ! 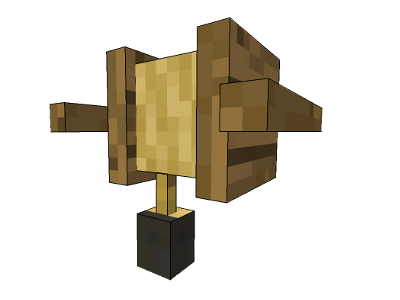 Just place default:wood and look what happens. It depends on my function_delayer mod https://github.com/HybridDog/function_delayer. No, that's a maze: https://github.com/hybriddog/maze.